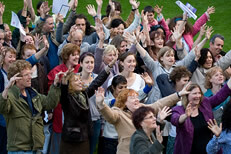 Sing London produces city-wide events in which the wider public can engage. 10 of Dublin’s most famous statues have been given the gift of the gab! Walk through the streets of Dublin, pass a Talking Statue, and get a call back from James Joyce (written by Roddy Doyle and voiced by Gabriel Byrne), Oscar Wilde (written by John Banville and voiced by Andrew Scott), or Fidelity on the O’Connell Monument (written by Paula Meehan and voiced by Ruth Negga)! Talking Statues Dublin has been funded by Fáilte Ireland, with additional support from Dublin City Council, An Post, the Abbey Theatre, Trinity College Dublin and Audible.co.uk. You’ve talked to statues…now, talk to walls! 26 walls across this Roman city have been brought to life by the people of Chester, from pub landladies to penguin keepers – plus the voices of Gyles Brandreth, Lucy Meacock and Louise Minchin. Talking Walls Chester is brought to you courtesy of CH1ChesterBID who represent over 500 city centre businesses. Partnering with Sing London, and using drama, off-the-wall humour and mobile technology, Talking Walls breathes new life into the walls that surround us all. New for spring 2017: Bedford’s statues are talking, too! Get a call back from John Bunyan (voiced by Matt Berry), prison reformer John Howard (voiced by Colin Salmon), big band leader Glenn Miller (written by Toby Litt) or a 5-metre tall silver face (voiced by Al Murray)! Sing London have worked with the Love Bedford Business Improvement District (BID), Bedford’s theatres and museums to animate 7 statues across the town. The project has been funded by The Harpur Trust and town centre businesses, whilst working in partnership with Bedford Borough Council, The Higgins Art Gallery and Museum, The Place Theatre, LifeBox Theatre Company and Bedford Central Library. Let’s get mouthy! Two statues on the Guy’s Hospital campus have been brought to life as part of Science Gallery London’s MOUTHY season of mouth-centric events. Hear from Dave Spikey as demigod of medicine Asclepius, and Ellen MacArthur as the voice of Daniel Silver’s Boat, a bronze sculpture inspired by a 2,000 year-old Roman sailing barge discovered beneath the new Cancer Centre’s foundations! Sing London have animated 10 of Leeds’ most popular statues as part of the Yorkshire Festival 2016! The statue monologues were created in partnership with West Yorkshire Playhouse and include contributions from some of Yorkshire’s most celebrated writers, actors and comedians. Hear from the Black Prince (voiced by Vic Reeves), from a Drury Dame (voiced by Game of Thrones’ Gemma Whelan), or from Brian Blessed as a large stone lion! On 20 March, London’s pocket parks, squares and piazzas were transformed into an immersive green playground. Search Party was the flagship commission for the Mayor of London’s Find your London festival. 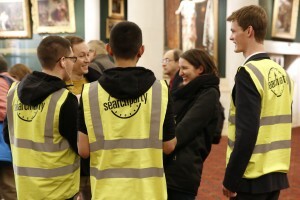 Two and a half thousand searchers shrugged off the windy weather and followed 3 trails as they searched for one secret party. Searchers were led and misled through hidden gardens, squares and side streets. En route, they found themselves confronted with a wide range of tasks: chanting with monks, identifying herbs, confronting gladiators, discovering the history of protest, joining a hula hoop troupe, hooking ducks, and working out the square root of dance. 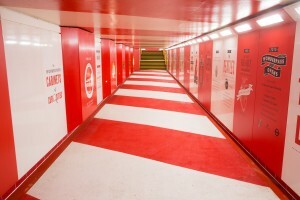 The Marylebone Road’s once bleak pedestrian underpass has been transformed into an intriguing Wonderpass. Part optical illusion, part local encyclopedia, part gallery, The Wonderpass introduces a new kind of urban crossing. The walk-through experience includes five Cabinets of Wonder. Each invites the passer-by to peek inside to learn about Baker Street’s rich cultural history and has been designed in partnership with a local cultural attraction. Statue Stories Chicago brings theatre to the streets and parks of Chicago. Launched in August 2015, it is funded by The Richard Driehaus Foundation. It is delivered with Steppenwolf, The Second City, Lookingglass and Goodman Theatres. Further support comes from Chicago’s Park District, libraries, museums, and from the Mayor’s Culture Department. Ping! London finished its 6th year on our streets in the summer 0f 2015! Ping! 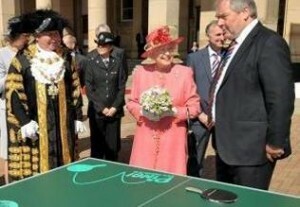 is the public ping pong project that installs tables in landmark locations for everyone to play on, from stations to stately homes, pubs to parks, markets to museums. Ping! is a free event – to take part, simply borrow a bat and ball from the side of the table and start playing. Talking Statues launched August 2014, generating media coverage across the world. Talking Statues gives voice to 35 iconic statues across London and Manchester. Pass a talking statue, swipe your phone on a nearby tag and get a call back from Queen Victoria, Sherlock, or Peter Pan… The project attracted contributions from the UK’s leading writers, actors and comedians – Patrick Stewart to Dominic West, Tony Harrison to Anthony Horowitz. The statues will talk for a year. To hear them talk, you need to pay them a visit. Find out who’s talking where: In Manchester and in London. 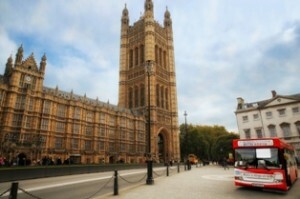 As part of Parliament Week, The Travelling Museum was invited to the Houses of Parliament to celebrate the home of many of the UK’s political and social innovations. Whether Parliament has been responsible for putting the wheels in motion or sometimes halting the transformation of British culture, Parliament has always been closely linked to Britain’s long history of innovation and invention. 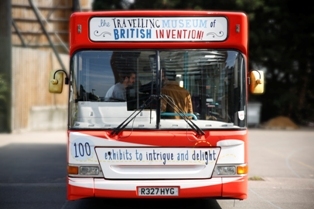 We added additional exhibits to our already packed bus and opened our doors to the London public for the first time! The Travelling Museum of British Invention is a bus filled with 100 of Britain’s most important inventions, discoveries and social innovations. Inventions are packed into nine themed cabinets of wonder and each exhibit tells a concise story using intriguing anecdotes, surprising artefacts and even the odd jar of facts. We began our bus tour in Scotland in October, stopping at public squares, shopping centres, schools and factories. Its purpose is to arouse curiosity and shed new light on British innovation. Admission is free and the bus is designed for people of all ages. Ping 2012 was a big hit. We worked across 7 cities, installing 700 public ping pong tables and the rest happened naturally. All kinds of people stepped up to the table – from novice to expert, workmen to banker, the very young to the very old. 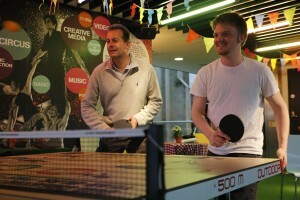 People played ping pong in airports and train stations, public piazzas and shopping centres, ping pong parlours, street markets, music festivals and forests. And then they played some more. Ping generated press attention across the world. It also helped trigger a new zeitgeist – bringing the game back into fashion! 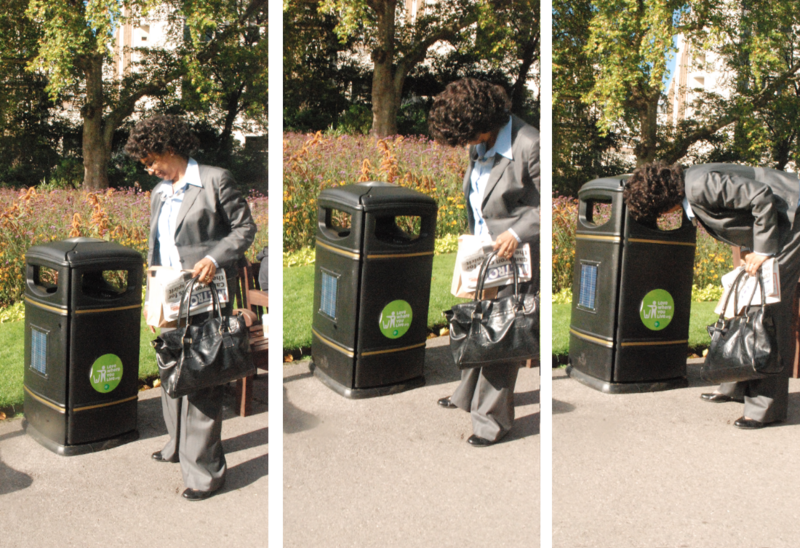 These bins are made for talking – and that’s just what they’ll do…and one of these days these bins are gonna talk right back to you! 30 clues, 3000 people, 3 trails leading to…1 amazing party! Taking treasure hunts to a new level! London’s largest treasure hunt took searchers into secret parks, hidden bakeries and got everybody thinking, talking and even dancing together. 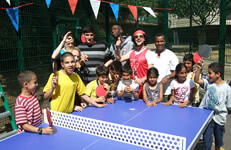 In Summer 2010, 100 ping pong tables popped up across London, in spaces ranging from the Tate Modern to Heathrow Airport, and across London’s squares, museums and shopping centres. 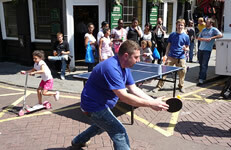 The tables were there for all Londoners to enjoy for free and attracted over 30,000 ping pong lovers. A festival to unite the city in song – all kinds of people, singing all kinds of music in all kinds of places. 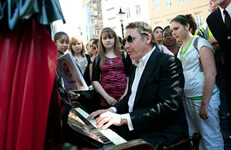 30 pianos and lots of sheet music were placed all over London ready for Londoners to play and sing along to. 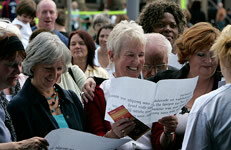 From July through August 2008, Sing London rolled out public singing events in museums, libraries and parks across the nation, from Belfast to Bradford, Cardiff to Cumbria, Hull to Norwich and Swansea to Walthamstow, the nation was united in song. Participating Towns & Cities: Belfast; Birmingham; Blackpool; Bradford; Cardiff; Coventry; Cumbria; Darlington; Derby; Hull; Glasgow; Leeds; Leicester; Liverpool; London; Manchester; Middlesbrough; Norwich; Oxford; Portsmouth; Rotherham; Southampton; Staffordshire; Sunderland; Swansea; Telford; Upton upon Severn; Walthamstow. 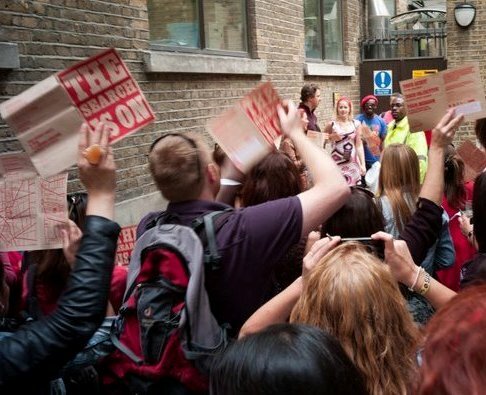 For 10 days in Summer 2007, Sing London rolled out public singing events in museums like the V&A, offering singing lessons from an expert from The English National Opera, and organising shopping centre and supermarket sing-alongs to unite the city in song.